If you’ve ever wished you could teach with tarantulas—or roly polys, or Madagascar hissing cockroaches—this is the resource for you. It tells how to help middle schoolers get up close and personal with amazing arthropods, the bugs that make up more than 75% of Earth’s animal species. Adventures With Arthropods provides 26 lessons that are geared to middle school teachers and their students but may be modified to use for elementary school, high school, and even college classrooms and for formal and informal learning at zoos, museums, and nature centers. The lessons—many of which support the Next Generation Science Standards—teach students everything from anatomy, growth, and behavior to eating preferences and environmental needs of three arthropod groups. They also illustrate arthropods’ many essential ecological services, without which global ecosystems would collapse. 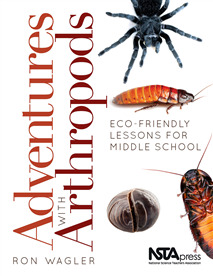 Best of all, the book addresses teachers’ concerns about keeping arthropods at school. You’ll learn which arthropods are classroom-safe and what’s involved in caring for them humanely. Through Adventures With Arthropods, you’ll discover how to choose species that don’t require too much maintenance and are sure to captivate both your students and you.